Deep in the interior of Aragon, Spain, lies a place few have heard of: Calatayud. Here, the air is dry, the terrain is unforgiving, and shattered rock stretches as far as the eye can see. It would seem that nothing could grow here. Yet somehow, Garnacha vines thrive on the arid, rocky slopes of Calatayud , creating some of the world’s most sought-after wines. Spain is one of the few places on Earth where vintners bottle pure Garnacha – or Grenache, as it is called outside of Spain – and Calatayud is home to some of the country’s highest Garnacha vineyards. Rooted deep in rocky, limestone soils at elevations of up to 3,500 feet, these vines see intense sunlight, prompting thicker skins and, ultimately, grapes with richer flavors. Cool evening temperatures mean fruit with greater acidity, giving Las Rocas wines a unique elegance and structure. Many of Calatayud’s Garnacha vines are nearly a century old, producing rich, robust wines. With flavors and tannins reminiscent of a Cabernet Sauvignon, matched by a structure similar to Pinot Noir, Las Rocas Garnacha has a distinct palate of red fruit, black pepper and earthy notes. Founded in 1962, Bodegas San Alejandro is located in Miedes, a town of 530 inhabitants about 55 miles north of Madrid, in the valley of the Ebro River. The dynamic winegrowers and winemakers of Bodegas San Alejandro bring the distinct characteristics of Calatayud and the unique flavors of Garnacha into every bottle of Las Rocas. The collection includes a Garnacha made from 30- to 50-year old vines, a Viñas Viejas Garnacha made from vines that are 60 to nearly 100 years old, and a Spanish Red Blend that brings Garnacha together with Tempranillo and Syrah. Las Rocas wines hail from Calatayud, in the southeastern corner of Spain’s Aragon region, where the air is dry and the terrain is unforgiving. Against all odds, Garnacha vines thrive on the steep, rocky slopes here, creating some of the world’s most sought-after wines. The Bodegas San Alejandro growers’ cooperative cultivates grapes from hundreds of small vineyards in Calatayud – many with vines more than 80 years old – to create the rich, robust flavors of Las Rocas. Las Rocas wines come from the steep, rocky vineyards in Calatayud that rest at elevations of 2,500 to 3,500 feet. The vines for our Garnacha are 30 to 50 years old, with loose, rocky limestone soils. The 2009 vintage brought exceptionally dry and hot conditions to the Calatayud region, resulting in a slightly higher alcohol level in the finished wine. Despite the warm weather, careful guidance in the vineyard yielded exceptional grapes with rich flavor characteristics. Following harvest at the end of October, the Garnacha grapes were cold soaked for several days to extract the deep, intense flavors of the fruit. During fermentation, which occurred at temperatures between 75°F and 82°F, the juice remained in contact with the skins for 15 days. The wine underwent malolactic fermentation, which softened the mouthfeel and added depth and nuance to the Garnacha. 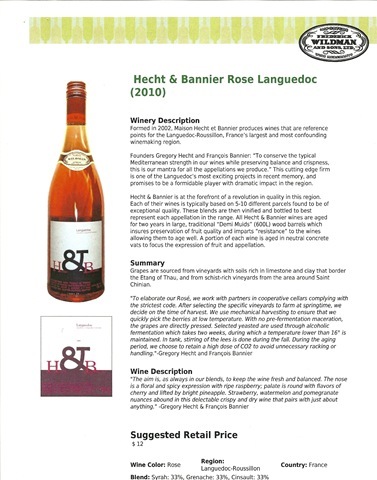 A portion of the wine was aged in French and American oak barrels for nearly one year. We liked the dark fruit colors, depth and food friendliness of this Garnacha wine. The red blend was more fruity and terrific for a picnic or easy going dinner (perfect for coq au vin) . The king (and what value for $20 . . . well worth double the price . . . ) was the Vinas Viejas. Bursting with cranberry and dark cherries, the tannins were subtle, but indicate good aging potential. Go with cheese, game, dark fish or Brazil nuts. Light, lively and lovely, all that bubbles need not be Champagne and here is a perfect alternative. Paired with Asian, Indian, meat, fish or solo, we liked La Marca Prosecco a lot. And at $17.00 SRP, the value is there. 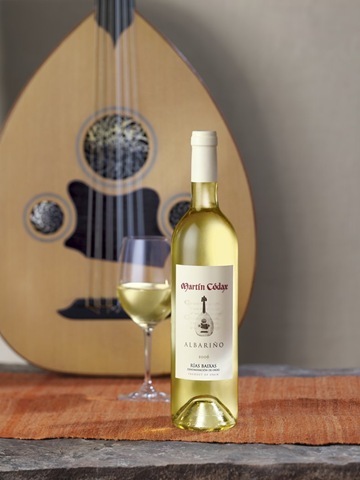 The Albariño wine of Martín Códax® is produced under the strict rules of the Rías Baixas D.O. (denomination of origin, or appellation). Translated from Gallego, the native language of Galicia, Rías Baixas means “the lower fjords”, referring to the deep fingers of water there that reach inland from the sea. Albariño wine is sometimes called “The Wine of the Sea” because of the impact that the Atlantic Ocean has on the weather over the vineyards, and because the wine goes so well with seafood from the local villages. The moderate climate and well-drained soils provide perfect growing conditions for Albariño – ample water, ample sunshine in the summer, and mineral-rich soils of eroded granite sand, chalk, and clay. The area is lush and green, unlike the common idea of Spain. It is cool, not hot, with many rivers running through hillside and valley vineyards. The landscape is so rocky that even the posts of the pergolas that hold the canopy of vines overhead in old farmstead vineyards are made of granite. Winter storms on the Spanish shore of the Atlantic bring moderate temperatures and rain from the southwest, a result of the circulation of tropical air from the equator. The ocean regulates the temperature over the land, with little difference between day and night. High pressure fronts from the Azores settle over the region in summer, giving a long, friendly growing season to the vineyards, with the driest weather perfectly timed for late ripening and a September harvest. Rías Baixas is divided into five sub-regions: Val do Salnes, Ribera del Ulla, Soutomayor, Condadodo Tea and O Rosal, the largest of which is Val do Salnes, home to Martín Códax wines. Albariño, long the best-kept secret of Spanish winemaking, is making its mark in the world. It is aromatic, complex but immediately pleasing, dry, but full-bodied: peach, melon, grapefruit and lemon zest flavors decorating a frame of refreshing minerality. One story says the grape was brought to the region from Germany by Benedictine monks in the Middle Ages and is descended from Riesling. Another story says the grape is native to the seaside hills of Galicia. This is a grape so special and so important in Spain that the grape itself is subject to regulation, not just the wine. Inspectors examine every load of grapes arriving at the winery to certify that they were grown in vineyards that meet the exacting standards set for Albariño in Galicia. Albariño is made to be enjoyed when it is young, and the flavors float on a slight tingle that touches the tongue on the first sip. “Refreshing” is a word often associated with this style. To preserve the delicate qualities and subtle sequences of flavors that the wine so generously offers, winemakers restrict their fermentations and storage to stainless steel. 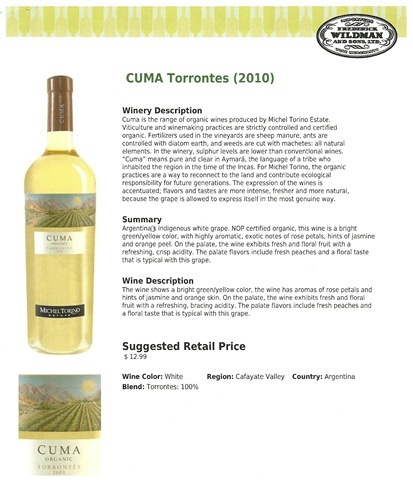 This is the style of Martín Códax Albariño. One hundred percent Albariño. One hundred percent estate grown. One hundred percent stainless steel. 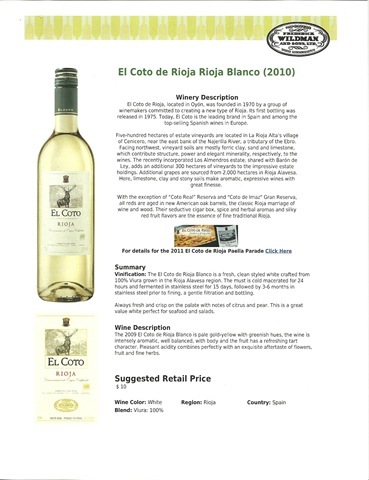 Delicious and highly recommended, this clean, crisp wine with its floral hints and pleasing balance of acidity is just one example of why the consumer should turn to Spain for excellent wines at exceptional value at $15.00, SRP. Lovely paired with shellfish, veal, poultry in light sauces and cold roast beef. Great with goat cheese. Graffit, is the New York debut of Spanish born chef Jesús Núñez, who built his reputation for artistic and modern Mediterranean food at his highly regarded Madrid restaurants, Plenta and Flou. 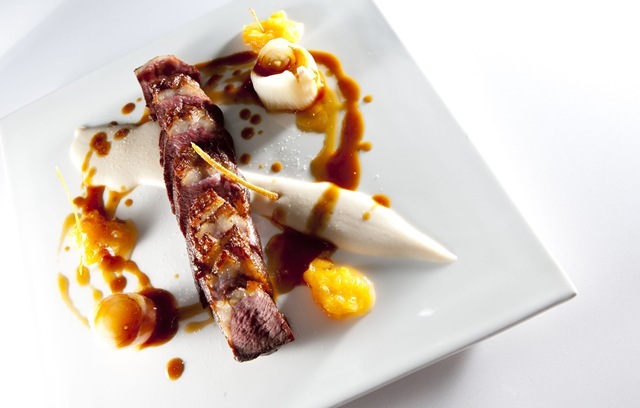 Núñez has been hailed as one of Spain’s leading chefs by the likes of the Spanish editions of Vogue, Elle and Gourmet, and both of his restaurants have been at the forefront of Madrid’s culinary scene. The design concept by Garrett Singer Architecture and Design (Hill Country Chicken, Klee Brasserie) is striking and divides Graffit into three distinct spaces: a minimalist Tapas & Bar Room, an elegant Dining Room and a delightful sunlit Garden Room. 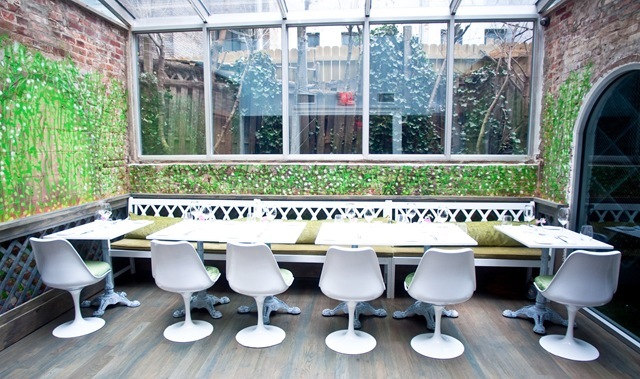 Singer and Núñez cleverly collaborated to translate the chef’s plating artistry onto the restaurants walls, adapting Núñez’ culinary style to the space’s interior through the use of variations of color, transparency and layering of surfaces. 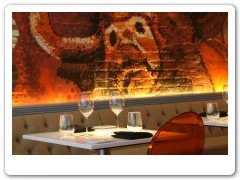 Graffit has commissioned Chilean-born graffiti muralist DASIC to paint explosions of color and dynamic intrigue throughout the restaurant (www.dasicfernandez.com). Aerial Design and Build, a NYC boutique construction firm, worked diligently with the design team to deliver high-quality workmanship. 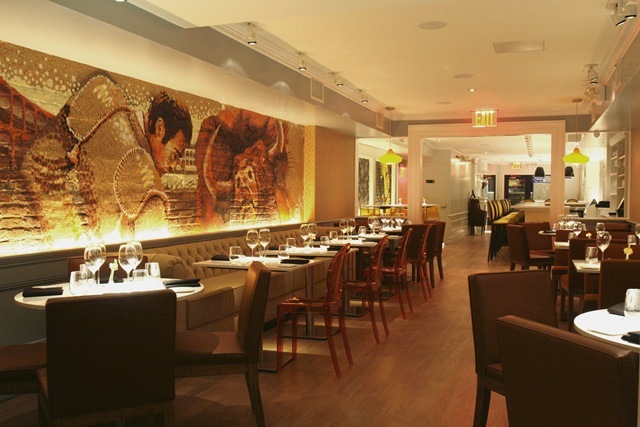 Núñez brings New York an outlet for the modern cuisine that has put Spain on the culinary map as one of today’s international gourmet destinations. Graffit is a meeting place for authentic Spanish flavors and nontraditional techniques, a crumble of Mediterranean and multicultural ingredients and molecular methods. 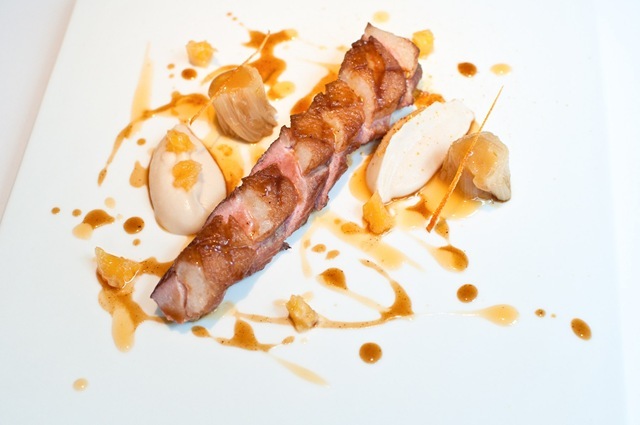 The stage for these edible works of art offers it’s diners two unique dining experiences. 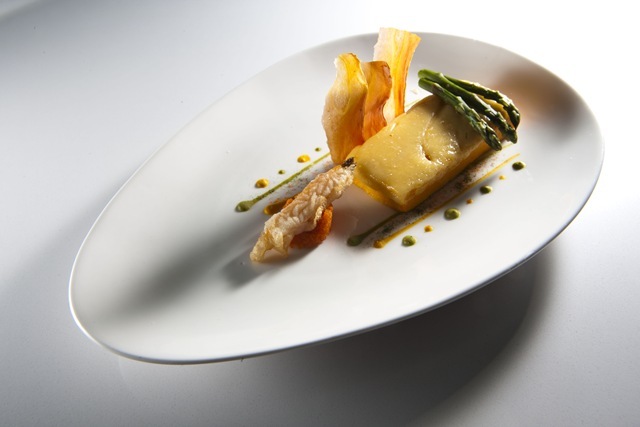 In the Tapas and Bar Room guests can enjoy Chef Núñez’ reinterpretations of Spanish tapas, such as the Tortilla Espanola Deconstruida (traditional Spanish omelet in seven textures). But some of the chefs most delicious creations have roots in his mothers kitchen, such as Albondigas De La Abuela jesús’ abuela’s or beef meatballs with sweet potato cream and purple potato confit. Simplicity shines in the light and flavorful meatballs, cotrasted by the crunch of the purple potato and sweet potato cream. Also excellent, Pulpo A La Gallega galician-style. Tender octopus with potato, spanish smoked paprika and spanish virgin olive oil. Tapas are large and a selection can make a meal in themselves. We liked Graffit so much that we suggest experiencing it twice and saving the main event for a second visit. If that is not possible, leave room, because the fine dining option is equal to some of the best restaurants in Europe. The Dining and Garden Rooms offer a beautifully created dinner menu featuring Núñez’ signature exploration of shape, color and most importantly flavor. Not to be missed appetizers include a light-as-air Savory Carrot “Cake” filled with Mahón Cheese and garnished with crisp Asparagus.. There is also an interesting Pear Salad, composed of Valdeón Cheese, Quince and Walnuts. 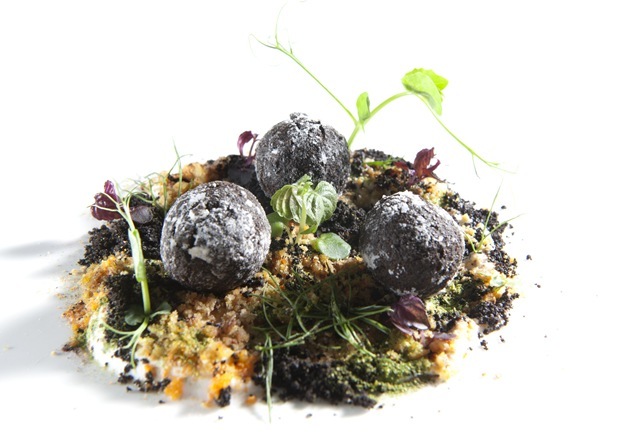 Not to be missed, is a gorgeous excess called Not-Your-Average Egg, Perhaps the most interesting appetizer offering is the whimsical “Fake Truffles” on “Edible Dirt” where falafel is gussied up with squid ink to look like a plate of the fungus, served with jet-black pulverized olives.,molecular yogurt and a splash of truffle oil. What a divine riff. When it comes to entrees, don’t miss Bacalao En Salsa Verde, Ñora, Prawns Cream and Egg Yolk. 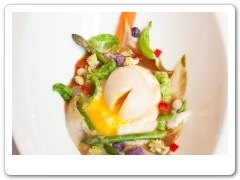 Salt cod comes on an oversized plate with strategically scattered steamed asparagus, and a raw egg yolk. The whole is decorated with prawn purée and salsa verde.LOVELY! Also terrific are the Slow Roasted Suckling Pig with Garlic Cream, Pimentón, Natural Jus and an intensely flavorful Duck Breast,with Apple and Potato. Núñez’ menu is accompanied by a beverage program replete with well-paired signature, innovative cocktails, such as a refined version of the traditional Andalusian Rebujito, and specially selected Spanish wines, including wine from the vineyard of one of Núñez’ partners, who is affiliated with Spanish winery Enate. 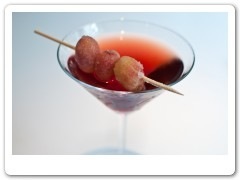 The Upper West Side Cocktail, served with 4 huge frozen red grapes and a Tequila Old Fashioned were as potent as they were memorable. Kudos to the amazing wine list and affordable pricing. We adored an elegant, floral and engaging 2005 Rioja, made from the Mazuelo grape from Valserrano, suggested by the personable manager Rogelio Espin Hernandez. 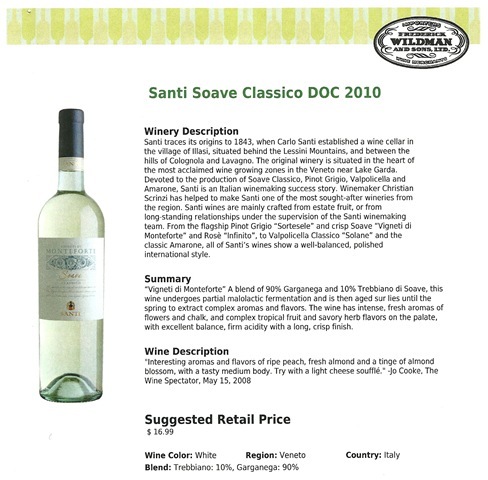 At $65 per bottle, it lays claim to being one of the best wine values in town. Desserts are fun and flavorful. Check out the Warm, Liquid Chocolate Fritters and A “Study in Spanish Moscatel, Service, from reception at the door to waitstaff and busboys is as good as any three star restaurant in Manhattan. Graffit with its superb location, near Lincoln Center, convivial atmosphere, affordable prices and excellent food, alas, is discovered, so reserve and enjoy. Frederick Wildman and Sons, Ltd., is committed to excellence, and is a major force in the world of wine in the United States. Here are three whites and three roses. All are under $20 and should make your sunny day even brighter! Both Argentine and Spanish wines (specifically Rioja wine) are among the fastest growing "categories" of all fine wine-growing countries. France has also emerged as a growing category for their “great value” wines as well as Italy. 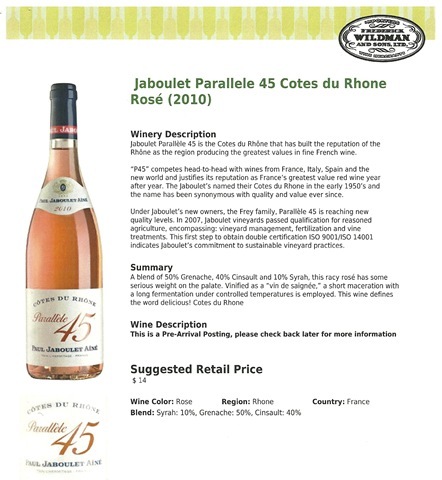 This selection spans all four regions and have very attractive price points. Whether you are an oenophile or a novice, five little words will be your guide to expert wine selection: Frederick Wildman and Sons, Ltd. You’ll never be disappointed. El Cotp de Rioja, was founded in 1970 by a group of winemakers committed to creating a new type of Rioja. lts first bottling was released in 1975. 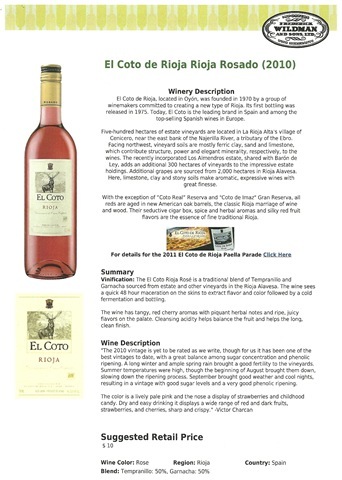 Today, El Coto is the leading brand in Spain and among the top-selling Spanish wines in Europe. SRP $9.99 for both Blanco and Rosado. 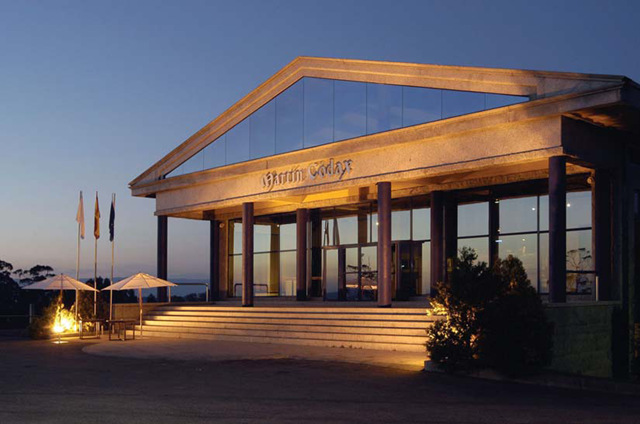 The Martín Códax winery was founded in 1986, as a cooperative made up of about 50 local grape growers in Galicia in the northwest corner of Spain. maintain a supply of top quality Albariño grapes, the winery acquired vineyards of its own and crafted long-term agreements with many family winegrowers whose grapes met their exacting standards. Today, the winery oversees more than 1,400 tiny vineyard parcels being farmed by 550 families in the Rías Baixas region around the town of Cambados. All the grapes that go into Martín Códax Albariño are estate grown and picked by hand. 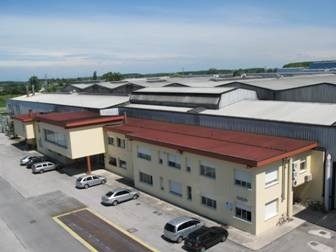 Martín Códax maintains its quality through continuous investment in research, innovation, and talented, creative people who enjoy the challenges of leadership. The “signature” wine of Martín Códax is Albariño, the versatile white wine, unique to the region, that has made Galicia famous among connoisseurs around the world. The wines of Martín Códax have won international acclaim and are available for sale in over 40 countries around the world. Winter storms on the Spanish shore of the Atlantic bring moderate temperatures and rain from the southwest, a result of the circulation of tropical air from the equator. The ocean regulates the temperature over the land, with little difference between day and night. friendly growing season to the vineyards, with the driest weather perfectly timed for late ripening and a September harvest. One story says the grape was brought to the region from Germany by Benedictine monks in the Middle Ages and is descended from Riesling. Another story says the grape is native to the seaside hills of Galicia. This is a grape so special and so important in Spain that the grape itself is subject to regulation, not just the wine. Inspectors examine every load of grapes arriving at the winery to certify that they were grown in vineyards that meet the exacting standards set for Albariño in Galicia. percent estate grown. One hundred percent stainless steel.